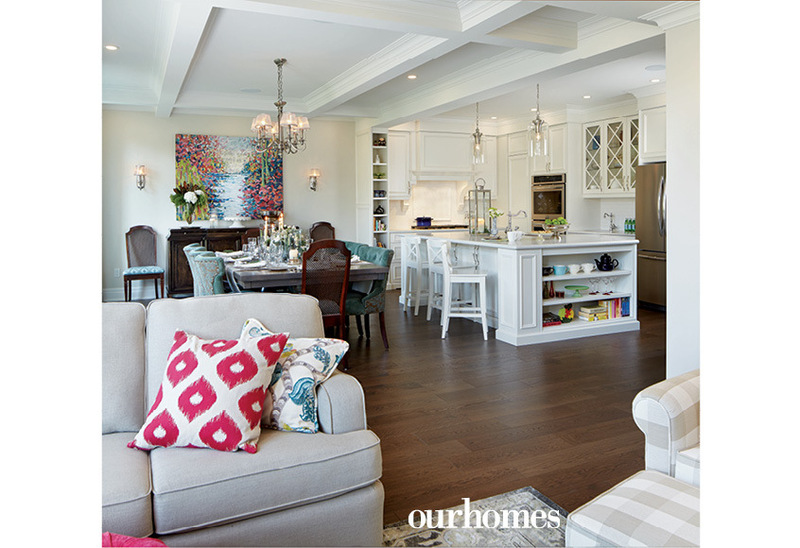 Bright open-concept space gets classic details with energetic pops of colour. A version of this article originally appeared in the Winter 2016/2017 issue of OUR HOMES Hamilton and Area, p.22. Find local businesses in our Hamilton directory. Armed with a binder full of home design ideas she had collected since her teenage years, a Hamilton-area homeowner and her husband set about renovating a 15-year-old home. The house was lacking the open-concept floor plan they both wanted, yet it had two features they were reluctant to give up: a terrific spot for their grand piano and a two-storey window in the family room. Nearly all of the rest of the house, however, underwent a transformation overseen by Rob Vanderbrugghen of Ridgeline Renovations. The size and scale of the renovation led Rob to recommend designer Mary Cath Altobelli of Alto Interiors to the team. At the heart of the reno: ditching the walled-in formal dining room in the centre of the space and creating an open-concept kitchen, dining and living area. A new table by Expressions in Wood in reclaimed elm with a double pedestal grounds the dining area. Four cane-backed, hand-me-down dining chairs from the owner’s grandmother were recovered in a rich green fabric. The couple commissioned local artist Marina Randazzo to create the focal piece of the new open space – an impressionistic take on a photo of the London Mall at Buckingham Palace (snapped by a cell phone during a recent trip). 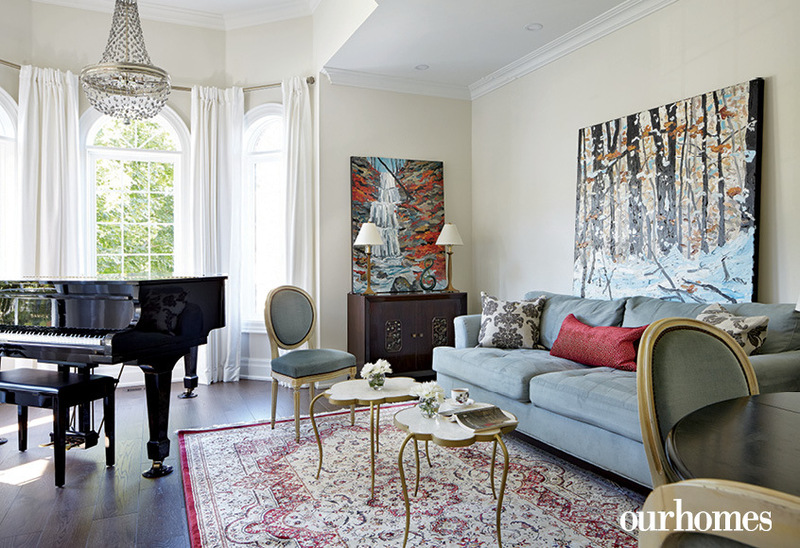 The colours in the stunning painting are echoed in the living room with turquoise custom-made accent pillows, a raspberry ottoman, and more muted shades in the rug, all sourced through Alto Interiors. 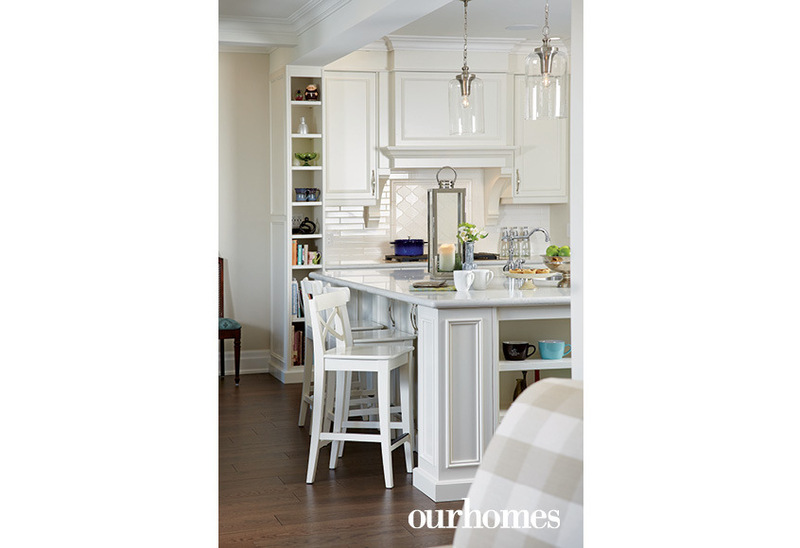 The new kitchen is a hub; its eight-and-a-half-foot island is topped with white and grey quartz. White cabinetry by Silverbirch Woodworks is accented by a backsplash of elongated white subway tile and a monochromatic Moroccan-patterned motif over the stove, both by Centura Tile. A tall, open-shelf display cabinet offers a visual distinction between the dining area and the kitchen area. Another big change to the main floor was the sweeping spiral staircase leading to the second level. While the footprint for the staircase remained the same, Trinity Rail & Trim replaced all the spindles and railings. Wainscoting runs up the stairs. In the conservatory, a wrought-iron and crystal chandelier lowers the ceiling to make the space feel more connected. The conservatory offers a beautiful space to play and listen to the grand piano. It’s also a brightly lit showcase of artworks: a chinoiserie detailed cabinet, blue velvet chairs and locally inspired paintings by artist Marina Randazzo. Mary Cath Altobelli of Alto Interiors (left) was integral in designing the highly functional open floor plan. 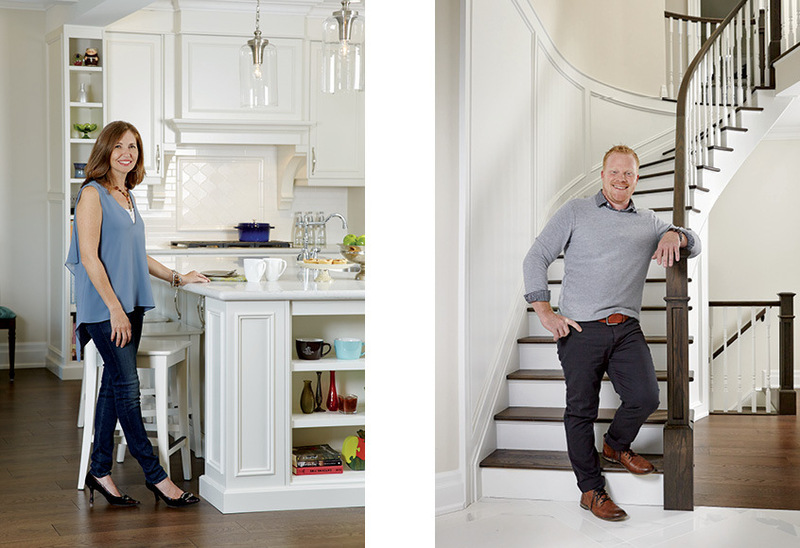 Rob Vanderbrugghen of Ridgeline Renovations (right) is particularly proud of the millwork and wainscoting they incorporated into the renovated staircase. The owners looked at new homes, but opted to renovate their existing home into what they wanted – an open-concept kitchen and more windows. The bright space has a coffered ceiling and beautiful mouldings throughout. Touches like vertical shelf between kitchen and dining area distinguish the spaces. Bright pops of colour lend a youthful energy to the classic furnishings in the living room area. Cloud White cabinetry coordinated with the similarly toned backsplash creates a classic look that won’t date. The owner didn’t want any blinds or shutters, only drapes, leading to the pooling drapes in the master bedroom. 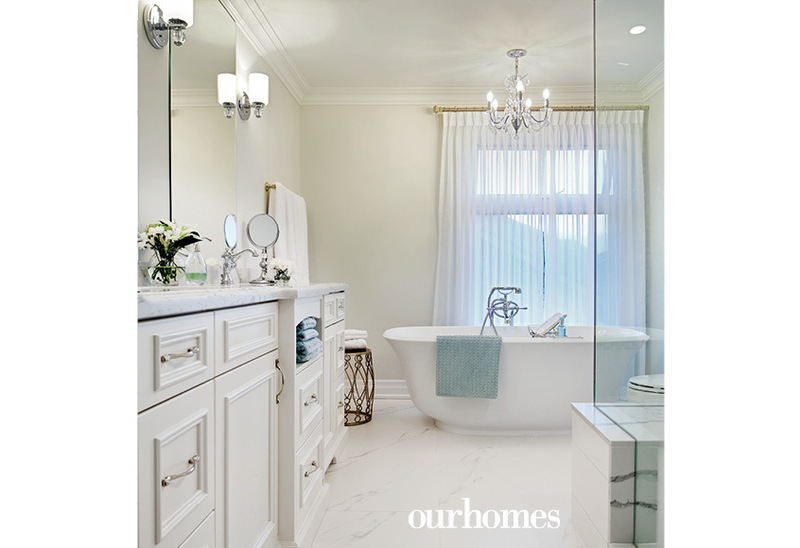 To create the spacious and spa-like master en suite, the couple gave up two large walk-in closets. 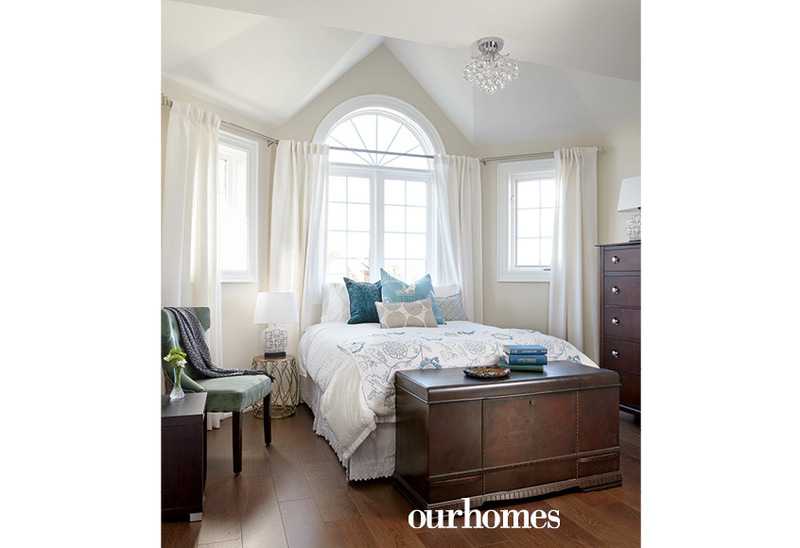 In the guest bedroom, framing the bed with the windows and drapes makes for a stunning focal point.